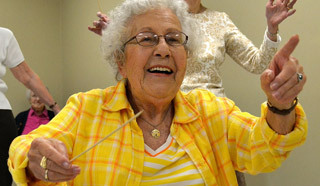 Body - Grace Ridge Retirement Community - Morganton, N.C. Through our affiliation with Carolinas HealthCare System Blue Ridge, Grace Ridge residents can participate in year-round wellness seminars and programs that lead to better senior health. Get fit with your complimentary memberships to Phifer Wellness Center and Mimosa Hills Golf & Country Club. Or just stroll on one of dozens of trails within our Western North Carolina haven. 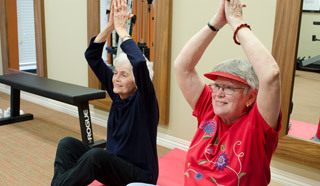 Keeping residents healthy and independent remains our top priority at Grace Ridge. To meet that goal, we stage annual health screenings, provide nutritional counseling and offer lively senior fitness programs such as Conductercise®. We also provide routine clinical services, from flu shots to blood pressure checks, for convenience and added peace of mind. Fitness at both Grace Ridge and nearby Phifer Wellness Center can keep anybody strong and flexible. Phifer Wellness Center, the largest facility in Burke County, features a 25-yard heated pool, racquetball courts, massage therapy, sauna and whirlpool to relax after an invigorating workout. At Mimosa Golf and Country Club, you’ll find an immaculate golf course, tennis courts and fine dining options. Our culinary team is dedicated to making meals both delectable and nutritious so you have the energy to play. We also have a registered dietician onsite to help ensure individual dietary needs are always met. From healthy breakfast options to protein-packed lunches and snacks, our dining program helps residents maintain a balanced diet without sacrificing taste. 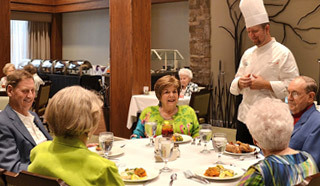 Grace Ridge also offers many ways to enjoy your meals with dining room, takeout or delivery options.